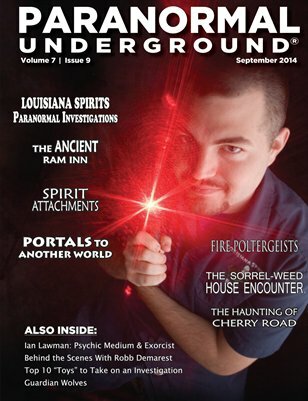 In this issue of Paranormal Underground magazine, we spotlight psychic medium and exorcist Ian Lawman, “Haunting: Australia” investigator Robb Demarest, and paranormal team Louisiana Spirits Paranormal Investigations. We also feature the haunted Ancient Ram Inn, the alien abduction experience, and guardian wolves. Other columns discuss spirit attachments, using sound for spiritual transformation, dream interpretation, and spirit portals. We also cover fire poltergeists, the haunting of Cherry Road, and an apparition caught on camera at the Sorrel-Weed House. For a PDF download or 12-month digital subscription to Paranormal Underground magazine, visit www.paranormalunderground.net! Or subscribe to our magazine via our apps on the Apple Newsstand and Google Play App Store!